Dr. Subhasri Chatterjee is a Post Doctoral Research Assistant at City, University of London. She received her PhD degree in Biomedical Engineering from the School of Mathematics, Computer Science, and Engineering (SMCSE), City, University of London (2014-2018). 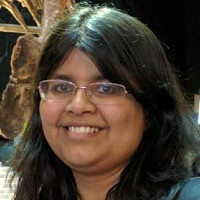 Her PhD project was focussed on the Monte Carlo invesitgation of the light-tissue interactions in photoplethysmography, and was funded by the Erasmus Mundus (INTACT) scholarship programme. Prior to that, she worked in the Department of Physical Sciences at Indian the Institute of Science Education and Research - Kolkata as a research intern under the National Photonics Fellowship of India (2011-2013) where she was involved in a project on early diagnosis of cervical cancer using optical methods. Her background includes a BSc degree in Physics (2006-2009) followed by an MSc degree in Biomedical Instrumentation (2009-2011), both from the University of Calcutta, India. Dr. Chatterjee's research interest lies in the investigation of the optical interactions in the biological medium by characterisation of the tissue optical parameters, and development of light-tissue interaction based algorithms and experimental technology for physiological measurement and early diagnosis. Chatterjee, S., Phillips, J.P. and Kyriacou, P.A. (2017). Investigating optical path in reflectance pulse oximetry using a multilayer Monte Carlo model. Chatterjee, S., Phillips, J.P. and Kyriacou, P.A. (2015). Differential pathlength factor estimation for brain-like tissue from a single-layer Monte Carlo model. Das, N.K., Chatterjee, S., Chakraborty, S., Panigrahi, P.K., Pradhan, A. and Ghosh, N. (2014). Fractal anisotropy in tissue refractive index fluctuations: Potential role in precancer detection. Chatterjee, S., Das, N.K., Kumar, S., Mohapatra, S., Pradhan, A., Panigrahi, P.K. … Ghosh, N. (2013). Probing multi-scale self-similarity of tissue structures using light scattering spectroscopy: Prospects in pre-cancer detection. Das, N.K., Chatterjee, S., Kumar, S., Purwar, H., Panigrahi, P.K. and Ghosh, N. (2012). A light scattering-based approach for quantifying tissue multifractality: Prospects in early diagnosis of cancer. Chatterjee, S. and Kyriacou, P.A. (2019). Monte carlo analysis of optical interactions in reflectance and transmittance finger photoplethysmography. Sensors (Switzerland), 19(4). doi:10.3390/s19040789 . Chatterjee, S. and Kyriacou, P.A. (2019). Monte Carlo model for reflectance Pulse Oximetry using pulsatile monolayer perfused skin tissue. Journal of Physics: Conference Series, 1151, pp. 12005–12005. doi:10.1088/1742-6596/1151/1/012005 . Chatterjee, S., Abay, T.Y., Phillips, J.P. and Kyriacou, P.A. (2018). Investigating optical path and differential pathlength factor in reflectance photoplethysmography for the assessment of perfusion. Journal of Biomedical Optics, 23(7). doi:10.1117/1.JBO.23.7.075005 . Chatterjee, S., Phillips, J.P. and Kyriacou, P.A. (2016). Monte Carlo investigation of the effect of blood volume and oxygen saturation on optical path in reflectance pulse oximetry. Biomedical Physics and Engineering Express, 2(6). doi:10.1088/2057-1976/2/6/065018 . Das, N., Chatterjee, S., Kumar, S., Pradhan, A., Panigrahi, P., Vitkin, I.A. … Ghosh, N. (2014). Tissue multifractality and Born approximation in analysis of light scattering: A novel approach for precancers detection. Scientific Reports, 4. doi:10.1038/srep06129 . Jagtap, J., Chandel, S., Das, N., Soni, J., Chatterjee, S., Pradhan, A. … Ghosh, N. (2014). Quantitative Mueller matrix fluorescence spectroscopy for precancer detection. Optics Letters, 39(2), pp. 243–246. doi:10.1364/OL.39.000243 . Das, N., Chatterjee, S., Soni, J., Jagtap, J., Pradhan, A., Sengupta, T.K. … Ghosh, N. (2013). Probing multifractality in tissue refractive index: Prospects for precancer detection. Optics Letters, 38(2), pp. 211–213. doi:10.1364/OL.38.000211 . Biomedical Optics Express, Journal reviewer. Journal of Innovative Optical Health Sciences, Journal paper review. Newton Researcher Links Workshops 2018: Bio-photonics For Medical Technologies. (Workshop) (2018). MEIBioeng/ MPEC2017. (Conference) Surrey, UK (2017). SPIE/ OSA European conferences on Biomedical Optics. (Conference) (2017). Pint of Science festival. (Public lecture) London, UK (2017). 37th Annual International Conference of the IEEE Engineering in Medicine and Biology Society. (Conference) Milan, Italy (2015). Erasmus Mundus STRoNG TiES & INTACT workshop. (Workshop) Nicosia, Cyprus (2015).